We’re excited to have Adam Smith, Andrea Shubert, and their incredible, locally crafted spirits back at the Bison! 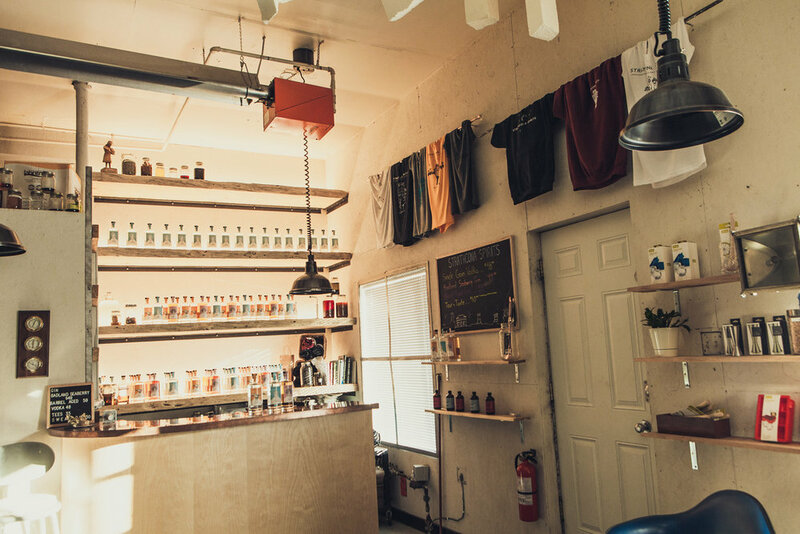 Edmonton’s first distillery, Strathcona Spirits produces small batch, award-winning spirits made using traditional methods and local ingredients in a tiny boomtown building in Old Strathcona. Catch them at the Bison both weekends, follow them on Instagram (@StrathconaSpirits) and read on to discover what inspires them to make top-shelf booze! Strathcona Spirits: Born from the ashes of a live arts space, the passion for the distillery was sourced from a strong interest in the real alchemy of distillation, the collection of essence, local flora, the fascinating world of aging spirits, and our desire for Edmonton to be a part of this history. SS: We sit surrounded by some of the finest grains available on earth, and you definitely taste this quality in the spirits. We’re also discovering untouched flavours from the Northern Boreal Forests that have never been used in spirit-making before. Needless to say, it’s a pretty exciting time for spirits! SS: Great. Edmonton’s creative community is definitely thriving, and it’s wonderful to see a small glimpse of this at the Royal Bison each year. SS: We’re always stoked to see anyone doing interesting, original, and creative work. An example of this would definitely be Gruger Family Fungi. Their hemp-based vertical mushroom farm is innovative, super-interesting, and they’re growing the most stunning (and delicious) mushrooms. SS: Get outside, build a massive winter fire, and sip on a steamy Strathcona Spirits Barrel Aged Gin Hot Toddy. SSD: The passion for the distillery was sourced from a strong interest in the real alchemy of distillation, the collection of essence, local flora, the fascinating world of aging spirits, and our desire for Edmonton to be a part of this history, being as we sit surrounded by some of the finest grains available on earth. SSD: Our Barrel Aged Gin is our newest release. Slow distilled, this full flavoured, citrus forward spirit is barrel rested in virgin, American white oak quarter casks. The outcome is a whiskey breath gin, complemented by spice and oak mingled with smoke, wild juniper, and citrus. Sip it neat, add complexity to a classic gin cocktail, or do the right thing and employ as a wild, whiskey substitute in an Old Fashioned or a Manhattan. 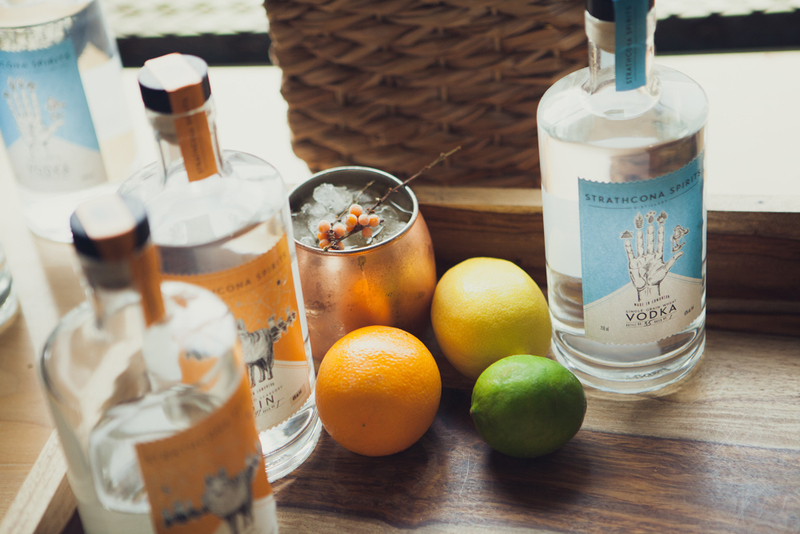 SSD: Big things are in store for Strathcona Spirits Distillery this year! This spring we’re renovating the exterior of our little boomtown building just off Whyte to welcome customers to our bottle shop for regular tours and tastings. We've also acquired 40 acres of land just south of the city where we’ll be able to farm and develop a botanical garden. We’ll continue to develop our line of meticulously crafted spirits. Expect a new release in the next couple months! SSD: Honestly, anyone that’s just getting their hands dirty doing intricate, interesting, & authentic work.